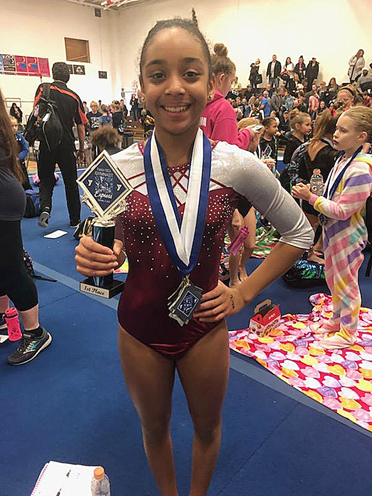 FRANKLIN, Pa. — Vysali Bommireddipalli took first in all-around at Level 2 for the Lakewood YMCA Starz Gymnastics team at the Gymnast Express Christmas Invitational. Bommireddipalli took first on the floor with a 9.6, third on the bar with an 8.9, fourth on the vault with an 8.4 and scored an 8.4 on beam to take first in all-around with a 35.3. Taytum Jimerson finished second in all-around at Level 5 with a 30.4 after taking first on the bar with a 7.4, third on the vault (8.6) and second on beam with an 8.7. Also at Level 5, Lilly McKinney was first on beam (8.0), third on the floor (8.6) and third on bars (7.0) en route to a third-place all-around finish (31.3). Mersadies Nichols was fifth on the bar (5.3) at Level 5 and finished with a 26.6 all-around score. Addison Calimeri was seventh in all-around (32.8) at Level 3 after a first-place finish on the floor (9.3). Teammate Alanna Byrd was eighth on bars (5.8), ninth on beam (8.4) and 10th on the vault (9.0) en route to a 13th-place all-around finish (31.2). Lexi Banko was 16th in all-around (29.6) while KirraBella Snarski finished with a 32.0. At Level 4, Emily Wehr was fifth on the vault (7.7) and fifth on beam (7.9) en route to a 29.8 all-around score. Olivia Pappalardo had an all-around score of 27.6 and Lillianna Simko finished with a 27.0.